St. Mary's One Topic One Night evenings. What is One Topic One Night? 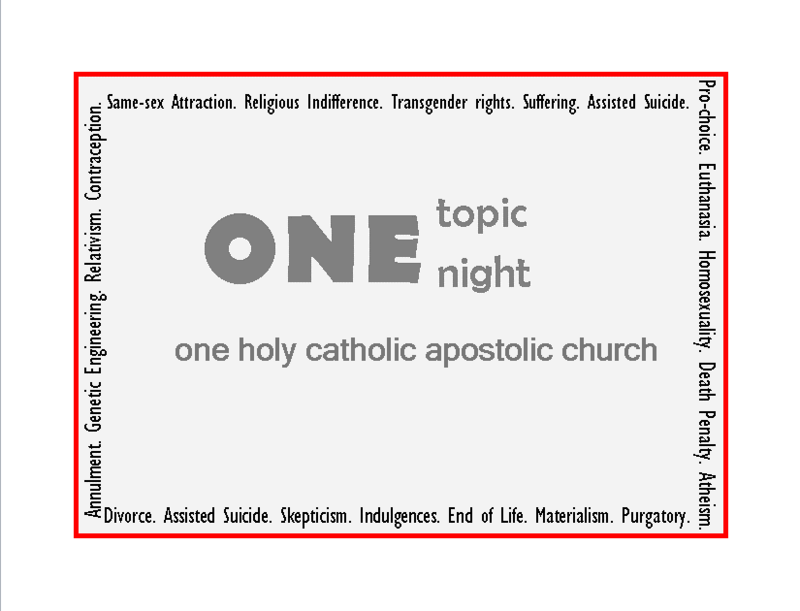 The One Topic One Night speaker series aims to provide our parish with a platform to foster dialogue, cultivate enriching ideas, and continue an appreciation of learning as an active and lifelong process. These evenings explore issues and topics of our faith in a more in-depth manner than can be covered in a homily, and provides time for follow-up questions and answers. A recent ONE topic ONE night explored the myths and truths surrounding divorce, annulments and re-marriage. Deacon Steve and Therese DeSitter shared their personal experiences and insights as annulment field advocates in the Joliet Diocese. Here are some highlights. The Sacrament of Matrimony is sacred to the Church; it does not take marriage lightly. An annulment is more properly called a Declaration of Nullity, as it declares that the marriage was never valid in the eyes of the Church. A petition for a Declaration of Nullity happens only after a civil divorce. It is a statement that at the time of the marriage, something essential is missing. Three criteria to consider: capacity, intention and the understanding the participants have of self, other and marriage itself. The annulment process is an in-depth investigation in which the marriage is on trial, not the individuals. It is not a process of placing blame or finger-pointing, but can be one of healing, honesty and forgiveness. marriage from the very moment the couple gave consent in the ceremony. Divorced Catholics are not excommunicated. They are still Catholic, since divorce alone does not affect a Catholic's status in the Church. Separated and divorced Catholics may receive the Sacraments. Any children of that legal marriage are legitimate offspring. A civil divorce or a Church annulment do not change the legitimacy of the children. The length of the marriage does not correlate with whether a marriage is valid or invalid in the Catholic Church.